Bull Products, manufacturer of life-saving fire protection equipment, have shared the most common health and safety mistakes made by the construction industry, and more importantly, how they can be avoided. According to HSE, falls from height are the most common cause of fatal injury to workers over the last five years, accounting for 8% of employer reported non-fatal injuries in 2017/18. Although this number may seem small, in reality, a large number of workers are putting their lives at risk when working on construction sites. Falls from height can be reduced with fall arrest bags as they minimise the risk of injury. They are designed to provide a safe cushioned landing, absorbing the weight of a fall without causing major injury. Training is also crucial and should be relevant to the tasks undertaken and the equipment used. A spill can cause major damage to a site and workers, resulting in slips, trips and falls. Slips, trips and falls can be minimised by communicating the hazard, clearing up and containing the spill, and assessing the risk after to ensure spills are minimised in the future. Workers should also effectively manage work areas and access routes to ensure they stay clear at all times. Guaranteeing you have the right fire safety and first aid equipment on site is vital to protecting workers. But often, there are not enough fire extinguishers, or first aid stations located on site. It is crucial to ensure your site has fire extinguishers located around the site, and more importantly, the right type of fire extinguisher to tackle the blaze, as using the wrong one can lead to more damage and repair costs. 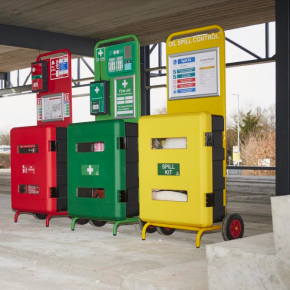 Bull’s Fire, First Aid and Spill Control First Responder Stations will also ensure that all the equipment you need is located and stored in one convenient place and can be moved around the site.